The tale of Let It Ride Design began with 3 guys, a basset hound and a dream. LIR was born from the ashes of a rock and roll youth, combined with an entrepreneurial spirit backed by business and industry experience. Refusing to accept the notion that business can’t be fun, and continuing to think not only outside the box but outside the whole room is what makes LIR what it is. Our stuffy, starchy collared shirts and ties are buried in a closet somewhere, and they aren’t coming out anytime soon. 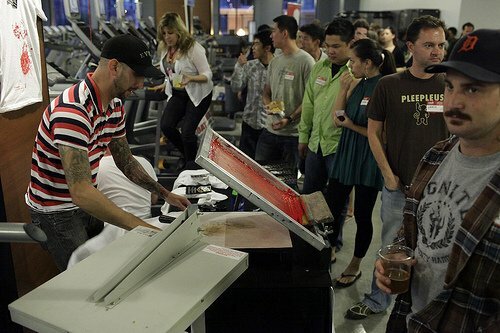 What began as a way to print for our friends in the music, nightlife, and service industry has blossomed into a full fledged printing company. What started as one room has grown into an entire office and production facility! We handle everything from 15 T-shirts for the baseball team down the street, to 5,000 Jackets for the nationwide restaurant chain. At LIR, we have a sense of community and friendship with our clients large or small. Come be a part of the family.